What is OWWA and how significant it is to OFW? OWWA or Overseas Workers Welfare Administration is an agency being managed under the DOLE or Department of Labor and Employment. What is the importance of OWWA? It is an agency run by the government which ensures the safety and well-being of the Filipino workers outside the Philippines. How will I be a member of OWWA? OFW for the purpose of accountability and may enjoy the benefits of being an OFW. Do my membership in OWWA expires? 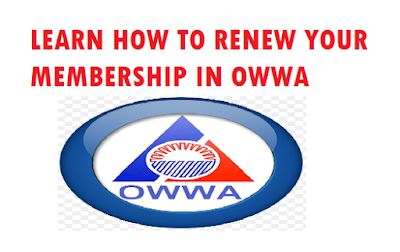 Technically yes, because every 2 years you have to renew your membership to OWWA or else you will become an inactive member and if something happened to you, you will not receive any benefits from OWWA. When will I renew my membership? If it is your first time to leave the country for work then count it from the beginning until 2 years. Other OFW who has just taken a vacation after 3 years and returning the same employer then they are obliged to renew their membership in OWWA. It is already included in the process during the renewal of OEC (Overseas Employment Certificate). It cost US$25.00 and multiply by depending on the rate of the dollar on the day you renew your membership. Can I renew my membership online at OWWA? As of now, OWWA doesn't have an online registration and payment for its member. How will I renew if I am outside the Philippines? 4. let a member of your family or any whom you trust with to do the transaction in the Philippines.